and yet Iran protests were so under reported. Why? Because IRI quickly kicked out foreign journalists and cracked down hard on any one seen with a mobile phone camera. Unfortunately Green Movement's leadership misguided the protesters when it was urged that no use of force be made by protesters, even in their own defense. Khatami, Mousavi and Karoubi were too concerned with cosmetically creating a Gandhi like image of themselves to the benefit Ahamdinejad. Throughout our history, if it was not for such clowns we would have been free a long time ago. Shemiran and downtown Tehran were the epicenter of the 2009 protests. The South of Tehran, and suburbs like Pakdasht and Robat Karim, were relatively quiet. More interesting is how quiet Mashad, Iran's second largest city, was during the unrest. The fact is that more Iranians attended Khamenei's June 19th sermon ,and the 9th of Deh anti-green rallies, than took part in the sedition. The figure of "3 million" descending on Azadi square is a complete myth, as is the number of "72" martyrs (same as Imam Hussein's companions) put out by Mousavi. The Egyptian revolution will only complement the Iranian one. Still nothing compared to the crowds at Azadi Sq. in Tehran. Even the picture you have sent does not show the Tahrir Sq. fully occupied. Azarmehr doesn't realize that Tehran is not Iran. After all, Mousavi won the vote in the city of Tehran. Where were the huge demonstrations in Mashad during the 2009 unrest? In Egypt, it is not just Cairo but Alexandria,Suez, Aswan and many other cities. That picture shows a few thousand people in Tahir Square, maybe 15,000 tops, filmed in a way intended to make them look like more, whereas there were three millions in Tehran. That's two hundred times as many. But then if you also include all the Western officials demanding a government with Muslim Brotherhood participation, why the numbers get right impressive. How do you know there were "millions" on the streets of Tehran? The BBC and other news agencies reported there were "hundreds of thousands" on June 15th 2009. The figure of "3 million" was invented by the opposition because it is the same number that participated in the 1979 revolution. However, there were "millions" on June 19th when people attended Khamenei's sermon and also on 30th December when people rallied against the green movement. Salam Reza. Shoma chetur hasten? Regarding your curiosity about what happened in Iran in 2009, let me try to help. First, having taken part in U.S. rallies that police estimated at up to half a million (such as Martin L. King's speech in Washington in 1963; yes, I am that old), I could see from youtube videos of the biggest Tehran demos that they were *much* larger, whereas, looking at pictures from Egypt, I could see that so far they have been *much* smaller. And keep in mind that the army is not suppressing the Egyptian protests, and there are no Basij hacking people with blade-weapons. Second, while virtually all of the Western media downplayed the extent of the Iran protests in 2009, they didn’t all lie so much as to claim that only a hundred thousand people demonstrated on June 13 and 15. "The protest seemed to grow larger than demonstrations on previous days. But it was not as big as Monday’s rally; that outpouring involved three million people, Tehran’s mayor said Thursday, making it the largest protest since the Islamic Revolution in 1979." If the above link will not load (it may only load for subscribers) you can find the Times story on blogs by entering the text, in quotation marks, in Google. Wasn't the Teheran mayor an Ahmadinejad supporter? So wouldn't it be reasonable to assume he reduced rather than inflated the count? "And although the Interior Ministry kept broadcasting a communiqué warning that no permit had been issued for the rally, 2 million to 3 million Iranians from a broad cross section of society converged on Freedom Square to demand a recount. 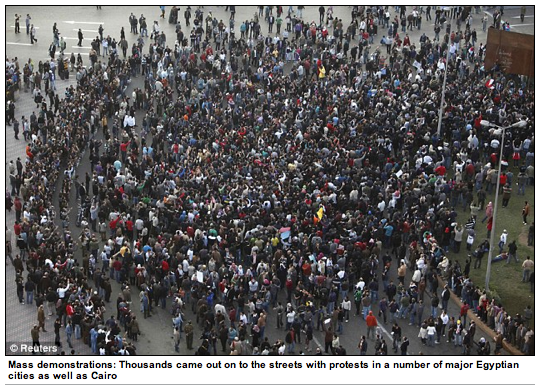 Look at the picture on the Time magazine page: a sea of people, stretching back for miles. In order to make the Egypt demos look huge, the media shows relatively small areas, with the obvious purpose of not exposing the boundaries, and consequently, the limited extent of the protests. (An old trick.) I have done a computer count of a couple of the photos from Egypt, and there are no more than 6,000 people shown, even though the article in question may refer to a million. 6,000 is relatively trivial in Cairo, one of the largest cities in the world. Consider that Ayatollah Khamenei’s supporters were organized and *required* to attend his June 19 so-called sermon; yet no millions attended. But Khamenei declared on June 13th that anyone attending the June 15th demonstrations would be an enemy of God, a capital crime! Yet millions did attend, attesting to their refusal to succumb to the clerical fascist regime -- and attesting to said refusal not by some act of violence or vandalism, but by an act of stunning heroism. This reduction reflected the trend in the western media to trivialize the Iranian movement as time went on, despite the personal enthusiasm many media personnel felt for the protesters. Here is a video from the 13th – just as on the 15th, a sea of humanity! Anyway, I’m glad you raised this question. It got me to dig up these media references. Emperor’s Clothes will publish an article comparing the protests in Iran and Egypt, and, thanks to you, thousands of our subscribers will get this evidence that the three million figure was *not* an invention of the protest movement. So, mersi mamnoon Reza! Hundreds of thousands does not contradict the 3 million number cited by opposition figures, it simply leaves it open ended. Secondly, how could "estimates" by foreign journalists (who were kicked out since they were part of the "western zionist conspiracy to attack Iran") be considered reliable? And how is it any more reliable than the same jouranlists' figures who have been kicked out in Egypt? All these numbers are inside sources passed through twitter and other unconventional methods of communication. How you are able to discern one source of information as valid, while condemning the other, considering the similarity of both conditions, I know not. Its interesting how lazily comfortable Islamists are with the numbers being projected in Egypt, without even attempting to further analyze them. But in Iran, they break tooth and bone to try and disprove the numerical estimates as if its granted a priori that one side is less suspicious than the other. This IR tactic of automatic ignorance and denial (practiced by Reza) is so transparent it's embarassing. Reza, do you realise how ridiculous you sound, you're like a prehistoric textbook. People need to completely ignore these sick individuals and not give them the credence they crave by engaging in their own debate. This is a guy that condones the slayings of our dear compatriots, we owe it to them to give this idiot the contempt he deserves. Your Hebraic compatriot, Roger Cohen of the New York Times, was the foreign journalist who gave the "3 million figure". He did indeed say that the mayor of Tehran, Mohammad Baqer Qalibaf, had announced this. However, Qalibaf is a conservative rival of Ahmadinejad - they really don't like each other: Qalibaf was supporting Mousavi in the election. Of course, 3 million would have meant more than half the adult population of Tehran showed up. There simply was not enough room for such a mass of people to descend on one area of the city. It is pure exaggeration. However, PressTV and Al Jazeera have exaggerated the numbers at Tahrir square - there were tens or at most hundreds of thousands present, rather than millions. All the same, it doesn't change the fact that Mubarak will be going and the Brotherhood will eventually take over. These are dark days for the Zionist state. Do you think that journalists don't have their own preconceptions? If you think they don't then you are seriously mistaken. In Iran their preconception (both Western media and al Jazeera) was that majority of Iranians supports Ahmadinejad who is against imperialistic US and terrorist Israel, that all Iranians hate US and US policy, and therefore protesters are mainly well-off, westernized people. And so they imagined that demonstrators could not have been from outside of Tehran, that they could not have been from all walks of life and naturally demonstrations were in reality smaller then reports on twitter said they were. That's why demonstrations number were underreported. In Egypt situation and preconceptions are quite different. Preconceptions ( and these preconceptions are mainly right) are that"
- Mubarak is supported by US. - Everybody/many in the ME hate US. - Muslim Brotherhood is against imperialism and Israel and is pro-palestinian. - All/many Egyptians are also pro-palestinians. - Muslim Brotherhood is among demonstrators. Egyptians from all walks of life are going to demonstrate against Mubarak & the West. So demonstrations have to be large, certainly larger then in Iran. Therefore twitter numbers are right. To Reza: Cohen is my Hebrew compatriot eh? What silly dreck. You seem to be obsessed with Jews. You know, I always find that kind of mental disability so startling, as if I had run into a being from a different planet. On the issues: If as Reza claims, Egypt were to fall to the Muslim Brotherhood, it wouldn't just be bad for the Jewish state, as all the media is saying, ad nauseum, with the same goal as Reza: to communicate that Islamism is FINE for everyone but Jews, or maybe even that if it weren't for those Jews everyone else would have no problem with the Islamists, who after all feed the poor and pray so movingly. In fact the people who would suffer most would be Egyptians (ask the Iranians about that), and, because of the immense international affect, everyone in the world would suffer, not least of all people in Iran, since Egypt would be then be the ally of the IRI: a unity of clerical fascisms. More strategic power to an IRI already much empowered by the West’s attacks on Afghanistan and Iraq, and Bush’s sponsorship of Erdogan in Turkey. As for the numbers of people in demonstrations in Iran: the pictures and videos from Iran that I linked to earlier speak for themselves. The pictures from Egypt show small numbers (LOW thousands at most, never more) and we never see pictures or videos showing the full boundaries of crowds -- only relative close-ups -- because, if pictures or videos were filmed from a perspective with sufficient depth to show the full extent of the crowds, people could not be sold the nonsense that the protests involve hundreds of thousands or millions. Regarding Ella's comment that false reporting results from reporters’ preconceptions: I don't think so. I think what the reporters send in is better than what gets published. The massive falsifications about Egypt -- the blatant lie that the protesters have been consistently peaceful (e.g., in the Guardian and comments published everywhere quoting Hilary Clinton) which lie requires that the media forget what they reported Jan 27-29; the lie that Mubarak has no support; the lie that huge numbers have been protesting; the lie that this is a largely secular protest movement --- these lies, so consistent throughout the media, requiring so much careful editing of stories to put across the falsehoods -- these lies have nothing to do with preconceptions and everything to do with organized policy directives in the major news sources and the usual conformity among the lesser media. None of this is accidental. This is policy, a policy which is duplicitous: anti-extremist pretense hiding a strategy of empowering pro-IRI Islamism. How else can you explain Western leaders so aggressively trying to destroy the government of an ally when this will obviously put into power a force that is the West’s SUPPOSED enemy, and which is allied with the IRI?